do you have a demo up anywhere? I removed both (did that already), but the error remains. After visiting plugins list page, I noticed settings link at least for a few plugins don't work. I had to acces the link manually and save the settings one time, or I couldn'use css edit. You're experiencing the same issue as I have. Did you find a more permanent solution? I'm also having this same issue for plugins and applications. Followed all steps mentioned in the above posts. The urls are wrong in my admin for the plugin settings. It is removing my subdirectory from the url. (van2/) Note that the only one that seems to have a correct URL is the reCaptcha plugin (but that has a bug in it too which I can't read as the popup to show the actual bug error doesn't scroll to show the full issue). Checked .htaccess and it has the subdirectory correctly added. Localhost on macbook pro, mamp pro testing on 5.6.34, 7.0.1 (tried both) Apache. Issue is similar to this, https://github.com/vanilla/vanilla/issues/5273 but I'm not on Nginx and don't have that helper file mentioned. **Note that my other clone of my main site on current stable release works fine to edit plugins and application settings. This clone was working fine until I updated to the beta. Any help from the developers? Dashboard looks very nice, Captcha working perfectly. Thanks to the developers, great stuff! What I found so far: when not logged in the "New Discussion" button still shows. You can click it, but then not choose a category. So it is still safe I guess but a bit confusing. 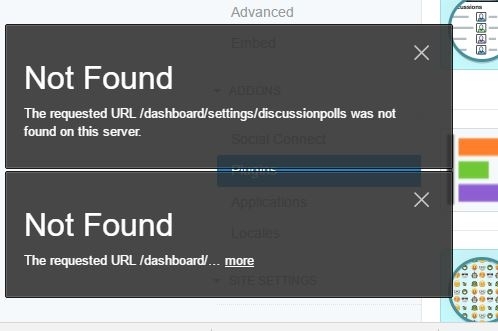 @data66 @HerrUU I believe you are having plugin-specific issues from code that needs to be updated for the new dashboard in 2.4. I'd try poking those developers specifically to have a look. If someone finds an issue with core, or finds a way to fix some backwards compatibility for this, I'm all ears. At this time, I do not see any issues blocking us from moving to RC1. Please highlight any here if I am wrong; preferably via a GitHub link. I'll test a fresh install again once RC is released. I believe this one I did was a fresh install but I added that nice plugin you had released to censor bad words to it. Sorry for my late reply. We were in the midst of a big software release which kept me a bit busy. When will it be ready the final release? Hi, I have to install another vanilla forum... I'm guessing you can't accomodate this kind of request.. but it never hurts to ask, right? Is there a 2.4 stable release I should use (instead of 2.3.1?). Thx. June is ending. Where is release? Any news on 2.4? We are discussing the possibility of moving to nodebb right now. But I would prefer to stay on vanilla if 2.4 is going to be released soon. So is there any news about version 2.5? I saw an earlier post stating late 2017. Update: Nevermind, I found it on Github. Going to test it out now.